Do you love a good Twitter Party? You know we do and we’re excited to host a party that will give you more info on how to become a Hunger Hero by simply purchasing a product your family already loves. On August 7th at 1:00pm ET, please join us for the #HungerHeroes Twitter Party where we’ll be discussing ways you can help feed hungry kids, and giving you a chance to win prizes! Summer is a wonderful time for our children, with full days of play and plenty of yummy meals and snacks. But what about children who come from very low income families? Summer for them, means no school breakfast or lunch and many of them go without eating. Tyson Chicken Nuggets is making it easy for us to help fight hunger. 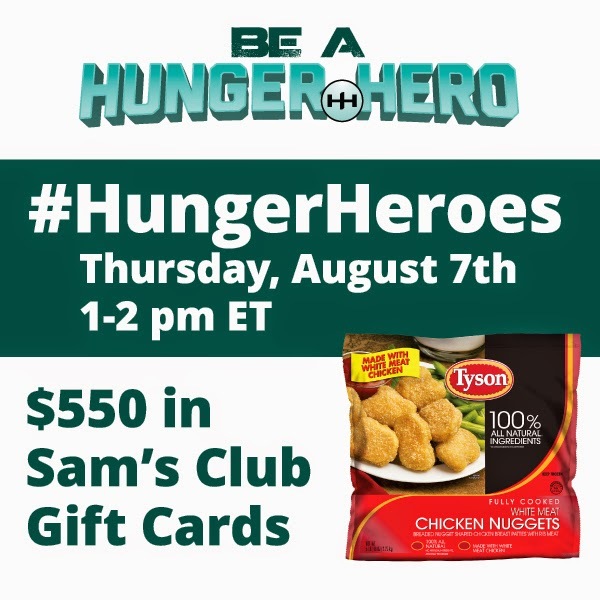 Tyson will donate a meal each time a Tyson® Fully-Cooked Chicken Nuggets 5 lb. bag are purchased at Sam’s Club during the month of August. What an easy way for all of us to give back! There is no need to spend more money than you normally would, or even make extra trips anywhere. Just pick up a few bags of Tyson Chicken Nuggets and spread the word, the more people who purchase these bags, the more little mouths we can feed!